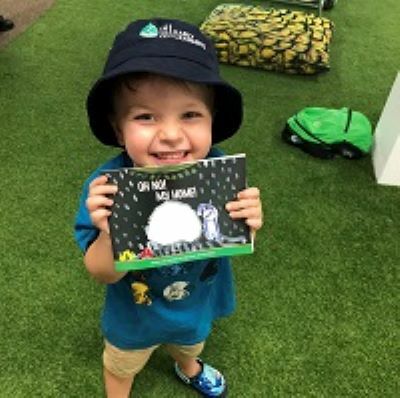 M10 client – Edge Early Learning – has recently discovered a newfound appreciation for storytelling, with their Milton centre picking up their pencils and creating their very own children’s storybook, which was unveiled at the Somerset Storyfest last week. The storybook entitled, Oh No! My Home! is the creative outcome of a collaborative effort between Early Childhood Educator, Shirona Davies, and her pre-prep class, off the back of an interactive workshop by renowned Australian author and illustrator – Christine Sharp. Christine’s interactive workshop was designed to upskill educators and provide students with a new and stimulating way of learning. It enabled Shirona to take her class through lessons in igniting imagination, the craft of writing, coming up with concepts of characters and a plot, all enhanced by illustration to produce the book. As Edge Early Learning’s engaged PR agency, M10 took the news of this initiative and conducted media outreach to secure coverage and brand awareness of the Group’s learning foundations and educational practice. Oh No! My Home! is focused on the adventures of two children called ‘Charlie’ and ‘Nina’ that go on a journey to try and help ‘The Ice Monster’ find a new home after his was destroyed by heavy rain. The storybook was completed by complementary illustrations designed by the entire class through drawing, painting and collage. As a Platinum Sponsor of the Somerset Storyfest, Edge Early Learning handed out Oh No! My Home! to over two thousand people at the Festival’s Prologue Party on Wednesday, 20 March. For more information, visit www.edgeearlylearning.com.au.